Ukrainian community leader from Kazakhstan visits Washington, D.C.
From left to right: Volodymyr Samofalov, Embassy of Ukraine; Michael Sawkiw, Jr., President, UCCA; Nataliya Holub, Embassy of Ukraine; Mykhajlo Parypsa, Association of Ukrainians in Kazakhstan; Peter Palukh. of the Ukrainian Congress Committee of America (UCCA). 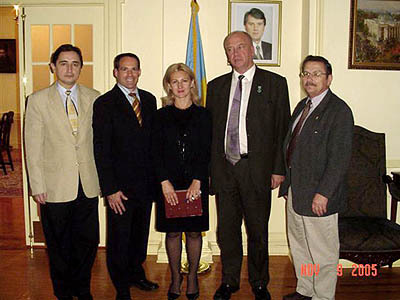 One of the leaders of the Ukrainian community in Kazakhstan, Mykhajlo Parypsa, visited Washington, D.C. on Wednesday, November 9, 2005. Mr. Parypsa heads the Association of Ukrainians in Kazakhstan and Taras Shevchenko Cultural Society, and serves a Deputy Head of the Ukrainian World Coordinating Council for the Eastern Diaspora. He is also a member of the Assembly of Peoples of Kazakhstan, a consultative organ to the president of Kazakhstan. Mr. Parypsa traveled to the U.S. at the invitation of the Ukrainian Congress Committee of America (UCCA). Mr. Parypsa visited Ukrainian American communities informing them about life in Kazakhstan. He thanked the Ukrainian American community for its valuable moral and sizeable financial assistance in constructing Ukrainian churches in Pavlodar and Astana, as well as a civic center and weekend Ukrainian school. While in D.C., Mr. Parypsa met with the Deputy Chief of Mission of the Kazakh Embassy in the United States, Talgat Kaliev. He also met with Ms. Natalya Holub, Second Secretary of the Embassy of Ukraine. Mr. Parypsa proposed the creation of a museum dedicated to former political prisoners in the USSR. He said that the extremely valuable KGB archives with information on political prisoners that served their sentences in Kazakhstan, including those from Ukraine, are now stored without supervision and irreplaceable documents may soon be lost forever. In a meeting with Susan Quatrone, a legislative assistant to Rep. Pascrell (D-NJ), Mr. Parypsa appealed for support in establishing the museum. Ms. Quatrone expressed confidence that this issue will find moral support in the Congress and promised to pass all details of the discussion to the Representative Pascrell.